I wanted to thank my pal in my blog. I am still in awe of all the wonderful things that she sent me. 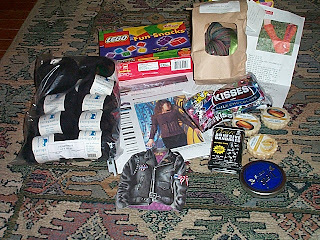 And most of all because whe really thought about it and gave me things that she really thought I would like and she was right!!!! Hemp yarn and an Eiffel sweater pattern, lace up gauntlets pattern and hand dyed yarn, cool skull stitch markers, kisses, lego gummies, pirate band aids. WOW!!! !